Wangzha Shangzun is a Great Holy Guru who has attained the level of Gold Button Grade 3 and the state of a non-retrograde Bodhisattva. The Shangzun rarely comes into contact with ordinary people. Finally, He met with a thousand Buddhists at Holy Miracles Temple in Pasadena, Los Angeles. On March 6, 2019, the temple was crowded with a large and orderly congregation of Buddhists. Their sole purpose was to meet Wangzha Shangzun. On the Dharma throne in front of the statue of the World Honored Shakyamuni Buddha, His Holiness Dorje Chang Buddha III imparted Dharma for the congregation.His Holiness the Buddha mentioned that only a few people have attained the state of a Shangzun in this Saha world. Anyone without inner realization power is not able to lift the 1,000-jin (approximately 1,100 pounds) Vajra scepter placed in front of the entrance of the Grand Hall of Shakyamuni Buddha. The Shangzun is a preeminent great Dharma king. According to Dharma rules, He must manifest Vajra power. Any person who has not completely opened up their nadis (energy channels) and chakras (bright focal point) is not able to lift a 1,000-jin Vajra scepter. Since it is not possible to find a 1,000-jin Vajra scepter, a weight set was used instead as the hall-blocking Vajra scepter. The Shangzun used the 1000-jin weight bar to perform Dharma and to bless the congregation. Nearly 1,000 faithful Buddhists held khatas with both hands and kneeled along both sides of the aisle to respectfully welcome the Shangzun. The Shangzun truly looks like a Vajra being. He is tall and burly, with a long beard, and a very dignified appearance. Upon arrival, He walked toward the Grand Hall of the Holy Miracles Temple. Before entering the Hall, the Shangzun bent over and reached the 1,000-jin Vajra scepter that had more than a dozen enormous weight plates at each end. He moved it slightly but did not pick it up. With a deep inhalation, He quickly lifted the 1,000-jin Vajra scepter with both hands, then dropped it down on the floor. A loud sound could be heard when the metal hit the ground. The congregation was astonished! They were joyful and full of praise! Wangzha Shangzun entered the Grand Hall through the center door and prostrated to His Holiness Dorje Chang Buddha III four times. With His back bent, He came in front of His Holiness the Buddha. His Holiness the Buddha blessed the Shangzun by placing His hand on the Shangzun’s head. The Shangzun then took His seat at the lower left side of His Holiness the Buddha. In front of the statue of Shakyamuni Buddha, the Shangzun addressed the congregation in perfect English: “Buddhist disciples, I’m very happy to see you here today. I’m happy because you have the karmic affinity in this lifetime to meet Namo Dorje Chang Buddha III. Thus, you’ll be able to learn the authentic Buddha Dharma, the unaltered and pristine Dharma. Because of this, you will be able to attain accomplishment within this lifetime. So of course, I’m very happy.” When His Holiness the Buddha was about to leave, Wangzha Shangzun stood up with his back bent and head bowed. With both palms facing upwards, He respectfully bid farewell to His Holiness the Buddha. Afterwards, the Shangzun returned to His seat and blessed everyone in the congregation by placing His hands on each of their heads. Faithful Buddhists who received blessings from Wangzha Shangzun included Dharma Master Zhengda who attained the level of Gold Button Grade 1, Jianhui Ruzun, and Akou Lamo Rinpoche, all of whom have attained high and deep realization powers. There are also rinpoches at the level of Blue Button Grade 3; other rinpoches, Dharma masters, and abbots from various temples at the levels of Blue Button Grade 2 and 1; as well as monastics and laypersons who attended the Dharma assembly. Some people felt a patch of coolness on the top of their head when they were blessed by Wangzha Shangzun. Some felt as if a thousand pound of weight was pressing on them when Wangzha Shangzun’s hands touched their heads. Some felt trembling throughout their bodies as if getting an electric shock. Everyone felt tremendously wonderful. After Wangzha Shangzun finished blessings everyone, the temple openly welcomed members of the congregation to sign up and take turn to try lifting the 1,000-jin scepter. More than a dozen monastic and laypersons tried but the 1,000-jin scepter did not move a bit. The Holy Miracles Temple is a holy site where three Buddhas once appeared in the sky and bestowed holy amrita through three layers of obstacles into a bowl. Wangzha Shangzun has formally established an authentic Inner-tantric Mandala in this holy site in accord with Dharma rules. This is also the only Inner-tantric Mandala in the world at the present time. In the future, Great Holy Gurus who possess the Inner-tantric Initiation Guru Qualifications can hold Inner-tantric Initiations for those Buddhist disciples who have been qualified through Determination by Holy Selection. 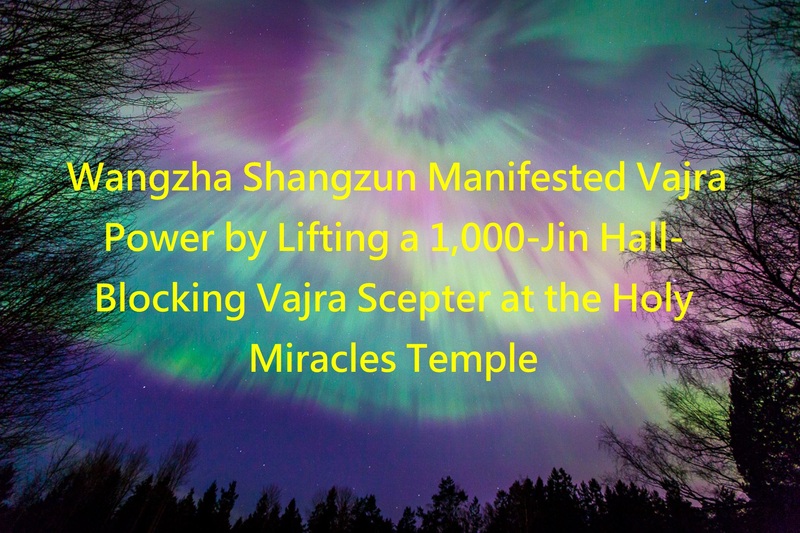 On March 7, 2019, the day after the Venerable King of Extraordinary Strength Kanqian Wangzha Shangzun manifested power to lift a 1,000-jin hall-blocking Vajra scepter at the Holy Miracle Temple, a Yuzun of even higher status came to the Holy Miracles Temple. She manifested Dharma power to uncover a terma with direct verification in front of nearly 200 people! Tibetan esoteric Dharmas are classified into two major categories. One category of the Dharmas consists of those translated from sutras or Dharma manuals, which is called Gama. The other category of Dharmas are uncovered terma called Daima. Daima is further classified into Southern Tibetan and Northern Tibetan. The Dharmas of uncovered terma mean these Dharmas are obtained by uncovering the terma and they are generally called Terma Dharma. A Terma Dharma can be further categorized as Uncovering Terma with Direct Verification or Uncovering Terma without Direct Verification. The word terton, meaning a master who performs the Dharma of uncovering a terma, is commonly used in Tibetan Esoteric Buddhism. Almost all followers of Tibetan Esoteric Buddhism know about it. Uncovering Terma without Direct Verification means the Buddha or the Patriarchs of previous generations, such as Shakyamuni Buddha or Guru Padmasambhava, hid the manuals of certain Buddha Dharmas or Dharma objects which were not suited to be transmitted to the world at that time, either due to immature karmic conditions or demons could be induced to cause damage. When the karmic conditions ripen at a later time, the terma will be uncovered by patriarchs of later generations so that the Dharma can be transmitted to people. There are two types of terma: the Upper Division Terma and the Lower Division Terma. Together they are called the Southern Tibetan Terma. Later on, Zenguo Jideng Qujian of Back Tibet inscribed and printed new terma manuals called the Northern Tibetan Terma. None of these is important. They are only about hiding sutras and holy objects. It is the uncovering of the terma that requires holy realization powers. However, holy realization power is not absolutely necessary for Uncovering Terma without Direct Verification. Sometimes, one can find a terma either by following written records, or by clues left by patriarchs. It has been a long time since the terma were hidden, and during this Dharma-ending era, there are various kinds of strange and low-level swindlers pretending to be holy people. It is hard to tell whether the terma were truly hidden by Gurus of the past, or if swindlers plotted to hide and uncover such things all by themselves. Therefore, to guard against these evil swindling masters who pretend to be holy people, Buddhas and Bodhisattvas stipulate that the person uncovering the terma must conduct direct verification to validate the authenticity of the treasure they uncovered. During the process of Uncovering the Terma with Direct Verification, no clues are permitted. The ritual is performed with caution and rigor. Ten people responsible for hiding the terma are selected among hundreds, thousands or tens of thousands of people by drawing lots. They are monitored by the congregation when they hide the terma. The Great Holy Guru who is confined at another place will uncover the terma in public. There is not any chance for foul play. In Buddhist history, those who have the realization power to uncover terma with direct verification include Guru Padmasambhava who retrieved the sutra imparted by the Buddha. There were also Patriarch Tsongkhapa, Patriarch Marpa Lotsawa, Matriarch Nairatmya and Dharma King Düsum Khyenpa. Even the Venerable Atisha failed twice in practicing the Dharma of Uncovering Terma with Direct Verification. You can imagine how high one’s realization power need to be in order to practice this Dharma. It is not something that just anyone with any level of holy realization power can achieve. A Shangzun of Gold Button Grade 3 can uncover a terma without direct verification, but it is almost impossible for a Shangzun to uncover a terma with direct verification. Great Bodhisattvas between the Eighth and Tenth Stage also do not have a one-hundred-percent certainty to uncover a terma with direct verification. Only a Great Mahasattva can uncover a terma and directly verify the terma with certainty and accuracy. Anyone who can uncover a terma with direct verification means that the Buddha Dharma or Dharma objects uncovered by such a great terton are authentic without any doubt. Therefore, Dharmas that have not been confirmed by direct verification cannot be considered as authentic. They are generally called mundane Buddha Dharma. A mundane Buddha Dharma must go through the Determination by Holy Selection to verify that it is a genuine uncovered terma of holy Buddha Dharma, or a holy Dharma object. The Determination by Holy Selection can only be performed by a Great Mahasattva or a Bodhisattva of Equal or Marvelous Enlightenment. Ten items of Dharma manuals or Dharma objects are used in Uncovering Terma with Direct Verification, not just one. There are ten individual items of which one of them is a genuine Dharma manual or Dharma object. The authentic item is mixed with the other items that look identical. Under the watchful eyes of the entire congregation, ten people responsible for hiding the terma are selected by drawing lots. They will go to a secluded room where the Tremendously Great Holy Guru uncovering the terma cannot see them wrapping and concealing the Dharma objects. After the Dharma objects are wrapped, they will be brought out and then hidden. Subsequently, the Tremendously Great Holy Guru uncovering the terma will immediately point out where the one holy object is. On the day of March 7, the female Tremendously Great Holy Guru, the Yuzun, came to the Grand Hall of Shakyamuni Buddha at the Holy Miracles Temple. She declined offerings from the more than 170 Dharma kings, rinpoches, great Dharma masters, and people in the congregation. Throughout the Dharma assembly from beginning to end, the Yuzun did not say a word. She is indifferent to fame or fortune. She did not reveal Her holy appearance. She came here with the sole purpose of manifesting true Buddha Dharma to universally benefit living beings by uncovering the terma. The Yuzun is at the level of Gold Button Grade 4 and she has incredibly profound realization and accomplishment. In this event, the holy object used for Uncovering Terma with Direct Verification was a “demon-detecting mirror.” Even people who have supernormal powers have no way to uncover this terma with direct verification. When the Yuzun began performing the Dharma, the demon-detecting mirror was mixed with nine other ordinary small mirrors that looked identical. The ten people, who were selected by drawing lots to hide the terma, were confined inside the Hall of Avalokiteshvara Bodhisattva located on the other side of the temple. They had absolutely no contact with anyone outside. The door was tightly guarded by people. The Yuzun and more than 100 people were somewhere completely separated from these ten people. There was no way for the Yuzun to communicate with the ten people. Inside the Hall of Avalokiteshvara Bodhisattva, the ten people used ten identical white khatas to wrap up the ten small mirrors individually. They then placed all the wrapped mirrors into a black cloth bag. Naturally, since the ten objects appeared indistinguishable, even the people responsible for concealing the terma could not tell which one was the demon-detecting mirror because they all looked exactly the same. After the mirrors were wrapped with khatas and placed inside the black cloth bag, they were all mixed up and no longer identifiable. Subsequently, these ten people randomly took out the wrapped mirrors and placed them at separate locations to hide the terma. Afterwards, they immediately returned to the Hall of Avalokiteshvara Bodhisattva and the door was closed. Even these ten people did not know where the demon-detecting mirror was hidden. Throughout the entire process, the Yuzun was nowhere near or in any contact with the mirrors or these ten people. While remaining in a separate tent, the Yuzun quickly held up a sign to announce where the hidden demon-detecting mirror was. At this time, the Buddhist disciples who hid the terma came out from the Hall of Avalokiteshvara Bodhisattva. As per the Dharma decree and the prediction by the Yuzun, the ten people proceeded to reveal the terma for verification. When the uncovered mirror was placed in front of an oil lamp in the center of the Grand Hall of Shakyamuni Buddha, the ten people were astounded. That truly was the demon-detecting mirror! More than 100 Buddhist disciples rushed forward in a disorderly manner to surround the small, palm-sized mirror. What was reflected from the demon-detecting mirror was not something a common mirror could show. One by one, people shouted loudly inside the Grand Hall of Shakyamuni Buddha: “Three lamps!” “I see five!” “Four!” “Eight!” Several people saw evil visages from the mirror! Yet, from the other nine identical mirrors, everyone could only see the reflection of one lamp. Nobody saw any evil visages. There were two rounds of hiding and uncovering the terma. In both rounds, the Yuzun effortlessly predicted the location of the real demon-detecting mirror by raising a sign to point out where the terma was! I am one of the persons who hid the objects. I must say, this is beyond incredible! With our eyes wide open, the ten of us tried and failed to tell which one was the demon-detecting mirror before the oil lamp was used for verification! The ten mirrors looked exactly the same, and they were all mercury mirrors. We could not even tell which one was the demon-detecting mirror when they were all laid out in front of us, not to mention uncovering a terma. The Yuzun did not even come close to the mirror, but She was able to tell exactly where it was. She truly is a Tremendously Great Holy being who has descended from the Buddha-land to the human world. We remembered the teachings of H.H. Dorje Chang Buddha III. The most important thing is to learn from Buddha and cultivate ourselves. Who cares if it is a demon-detecting mirror or not! It will not enable anyone to attain accomplishment. The significance of uncovering a terma with direct verification is not about the demon-detecting mirror, but about the fact that the Yuzun was able to correctly raise the sign to openly announce where the holy object was located among all ten identical mercury mirrors. With the eyes of an ordinary person, we saw that all these mirrors looked exactly the same. Even though the terma was hidden, it had no way to hide from the Yuzun’s realization power. Raising the sign to announce the location of the terma is no small feat. Just imagine, if it were another great Dharma king, or if it were you or me, would we dare make such an announcement? Would we dare take a blind guess? It has to be revealed in front of the congregation for the truth to be verified! This cannot be done by speaking falsehoods, giving a discourse, or bluffing! If what was uncovered was not the holy object, how would you face the public? You would be completely ruined from then on! Therefore, the difference between a Tremendously Great Holy Guru and a holy virtuous person can be seen the moment the sign is raised and the truth is revealed with definitive result. Even for holy people who possess the supernormal power to see through walls, rocks and mountains, they would only see that all the mirrors looked alike. They would not be able to distinguish which one was the demon-detecting mirror. How could an ordinary person possibly possess any realization power that is remotely comparable to that used in uncovering a terma with direct verification? After the Dharma was performed, the making of the extremely rare Greatly Precious Pills was also completed. These Greatly Precious Pills blessed by Buddhas are required for performing the Dharma of Uncovering Terma with Direct Verification. Everyone in the congregation was very moved, and they were determined to do their best to make offerings to the Yuzun who is a Great Mahasattva. The Yuzun, however, did not say a word or accept any offerings. She left without a trace. What remained was the sigh of Buddhist disciples: “There are so many people with the titles of great Dharma king, great Dharma master, holy person or great Bodhisattva. Some of them are so famous. They have written so many books and given so many empty discourses. Yet they have no realization power, and in whatever they do, all they want is to accept offerings. Not only do they not have true Buddha Dharma, they have not even seen it performed! Which one of those famous figures has ever manifested the same kind of Dharma realization power as the Yuzun? Can they perform the Dharma to uncover a terma with direct verification for those living beings who are so eager to seek Buddha Dharma to see? Can they do that to verify the lineages they hold are that of true Buddha Dharma? You cannot find even one of them who is authentic! This is something for everyone to give some serious thought! We at World Buddhism Association Headquarters will assume all legal liability for the veracity of this statement. H. H. Dorje Chang Buddha III is the supreme world leader of Buddhism. Such a status is not self-investiture! The status of H.H. Dorje Chang Buddha III as a Buddha did not result merely from Buddhists calling Him that out of respect. Rather, in accordance with the Buddhist system of status-recognition that is more than 1,000 years old, such status was recognized by those Dharma kings, regent Dharma kings, and eminent monastics who have status-recognition authority within Buddhism. They include Dharma King Dodrupchen, who is the sole lineage-holder of the highest Rainbow-Body Accomplishment Dharma; Dharma King Penor, who was the third supreme world-leader of the Nyingma sect; Dharma King Achuk, who was the foremost monastic of great virtue in modern Tibet; Dharma King Gongbao Dumu Quji, who is the Yidam-Dharma Initiation Master of the 17th Karmapa; Dharma King Jigme Dorje, who is the supreme world-leader of the Jonang sect; Sleep Yoga Dharma King Mindrolling Trichen, who was a master of the Dalai Lama; Dharma King Trulshik, Dharma King Taklung Tsetul, and Dharma King Chogye Trichen, all three of whom were masters of the Dalai Lama; Dharma King Jigdal Dagchen Sakya, who is the supreme leader of the Sakya sect; Regent Dharma King Shamarpa, who was a master of the 17th Karmapa; Regent Dharma King and National Master Goshir Gyaltsab, who is the Sutra-Master of the 17th Karmapa; and others. These leaders are all publicly known in current Buddhist circles to be first-rate eminent monastics and people of great virtue from various Buddhist sects. All of them have individually issued an official document of recognition or corroboration to affirm the status of H.H. Dorje Chang Buddha III. All such documents carry recognition authority according to Buddhism. The accomplishments of H.H. Dorje Chang Buddha III in the Five Vidyas are the highest in the history of Buddhism. Shakyamuni Buddha, the supreme leader of Buddhism in our Saha world, prescribed in the sutras that “Bodhisattvas must possess the Five Vidyas.” Since Bodhisattvas must possess the Five Vidyas, a Buddha must all the more be a champion in the Five Vidyas. When H.H. Dorje Chang Buddha III was still living in China, because He propagated Buddhism and upheld justice and morality, He was persecuted by some people in the Chinese public security system. On August 1, 1999, H.H. Dorje Chang Buddha III came to the United States with a valid visa and subsequently settled down here. During the almost twenty years since then, His Holiness the Buddha has never returned to China even once. However, on June 20, 2002, the Chinese public security bureau in Shenzhen went so far as to groundlessly fabricate the allegation that H.H. Dorje Chang Buddha III “in April of 2000 in Shenzhen, sold a building to Liu Juan, defrauding Liu Juan out of RMB150 million.” They used this pretext to establish a case and started to persecute H.H. Dorje Chang Buddha III and some of His disciples. With respect to the recognitions of the status of H.H. Dorje Chang Buddha III, the letter from INTERPOL, evidence that H.H. Dorje Chang Buddha III was persecuted, and other information, please go online to the website https://ibsahq.org/buddha-en. Just as we did in the past, we at World Buddhism Association Headquarters will take the teachings of H.H. Dorje Chang Buddha III and Namo Shakyamuni Buddha as our foundation and will guide Buddhists all over the world to learn and practice the Buddha Dharma so that they will become good people who are unselfish, benevolent, and law-abiding, who contribute to society and have happy family lives, who eventually realize the true suchness of Dharma-nature, and who attain liberation.